Did I mention I’m telling stories about Highway 89 and signing books Thursday evening at the King’s English Bookshop? I’m so proud to be featured at MY locally owened neighborhood bookstore. There aren’t too many left in America, and we are blessed to have one right down the street, and a good one at that. There’s always a story about US89, America’s greatest highway (IMHO). 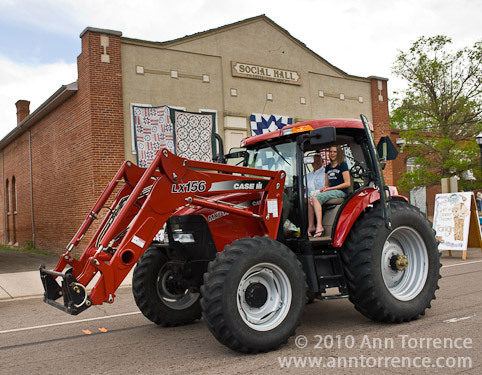 This weekend I went to Panguitch for the Quilt Walk Festival. The event commemorates a heroic event in the town’s history. In the first winter of 1864-65, the town was running periolously low on provisions, and seven men attempted to cross a snow-covered mountain range for help. Foundering in deep snow, the men discovered they could cross the snow if they walked on the blankets, leap-frog fashion. The men made it over the mountains to safety and relief supplies were sent to the village. The festival celebrates with quilt shows and classes, a dinner theatre, home tours, and of course a parade. When I think of all the parades, and there were many, that I photographed for the Highway 89 project, not one was troubled by rain, until Saturday. One tractor driver carried on under an umbrella, but the parade went on. 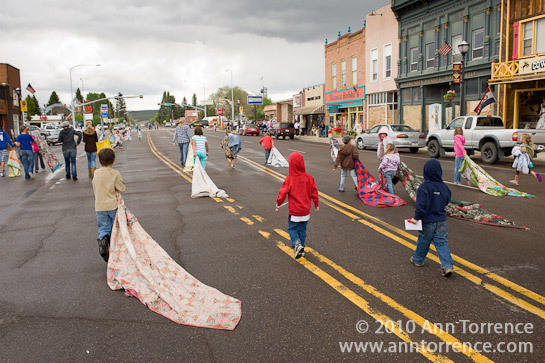 A short parade, with Highway 89 completely blocked, because it was followed by the Quilt Walk race. Huge bundles of quilts and blankets appeared at the main intersection. 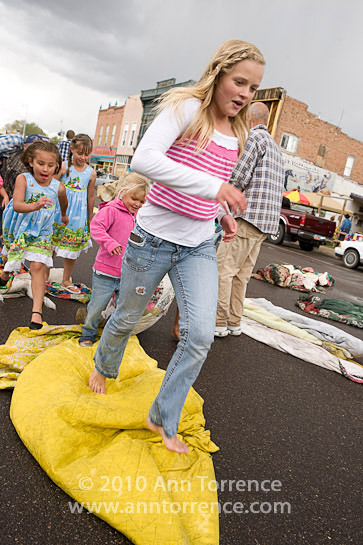 Children poured into the street and sorted into groups of seven to recreate the Quilt Walk down Main Street. One kid didn’t quite get the instruction set and took off running with his blanket, and he was most disappointed to be called back by his team. Blankets kept flying forward, kids leaping from quilt to quilt, until winners were declared and envelopes with small bills passed out as prizes. The kids had a long march back to the starting line. Books will be available for purchase or bring along one you have already bought. P.S. King’s English is a great play to pick up that last minute Father’s Day gift. If Dad likes travel, Utah history or the romance of the road, he might just like a certain book on Highway 89. I’ll absolutely be there! Looking forward to making an image of you behind a desk signing books. Yea for Highway 89! Yea for Ann!